I found these awesome crackers a while back and then was pleasantly surprised to find that they were a local mom & pop operation. Imagine my even bigger surprise when I’m eating these same crackers at my uncle’s house on Christmas Day later that year and find out that Brown Box Crackers was my own cousin’s company! I asked her if we could share this recipe with you and introduce you to her awesome products. I shared this quite a few years ago and unfortunately the crackers are no more as she passed away in 2014 and no one was able to find her recipes. They probably existed on her hard drive, but alas my uncle never bothered to search and the hard drive is rotting away in storage, probably under water or too wet to be salvaged. I have made some substitutions to make it similar to her original recipe. Process onions, jalapeno and garlic in food processor. Adding just enough water to form a paste. Combine all ingredients except for the cracker crumbs by squeezing though fingers JUST until blended. Once the ingredients are mixed well add the crackers and mix them through. Divide burger mixture into four (4) equal portions and form into mini loaves or form one large loaf. Place in a casserole or large, heavy oven-proofing frying pan. The heavy frying pan is excellent for getting all the “good stuff” for the gravy. Bake approximately 1 hour to 1 hour 15 minutes. Add flour and stir constantly to a bubbling caramel roux. Add beer and broth continuing to stir constantly. The roux will smooth and thicken. Add more broth if necessary. 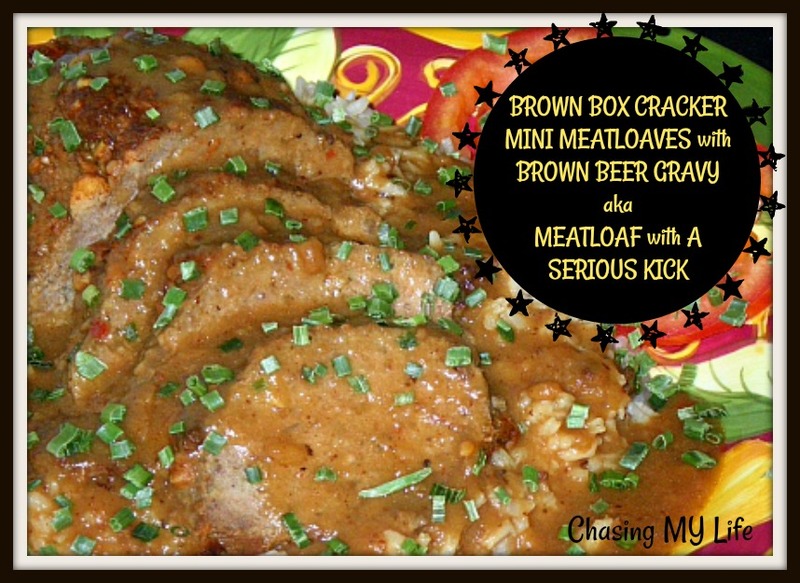 Serving Suggestion: Slice meat loaf and top onto a mound of rice, cover in gravy and serve with a side of fresh sliced tomato. NOTE: Use beef broth INSTEAD of water when preparing rice. You will be pleased!